When a tile is placed, both colours on the tile are scored – you score 1 point for each matching colour that can be traced in every direction from the tile in an unbroken line (neither of the colours on the tile itself count). It’s really simple and I’ll give an example using the screenshot on the right: A tile is placed in the right-most column just below the two red stars already present with a red star is at the top and yellow circle at the bottom. This would score 3 red points and 1 yellow point. 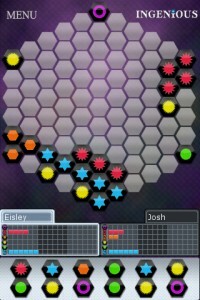 If a player reaches 18 points in any one colour, they immediately take another turn. The game ends when no more tiles can be placed and the players compare the lowest single colour score they have. The player with the highest of these wins. For example, player A’s lowest score is 4 points in red and player B’s lowest is 6 points in yellow – so player B wins. If there’s a tie, players keep comparing their next lowest scores until the tie is broken. Ingenious is an excellent game – quick to play and different every time. You have to ensure you develop all of your colours evenly because lots of points in 5 colours mean nothing if you have very few in your 6th colour; however, it’s always tempting to grab some big points in a colour even if it’s not your weakest. It’s especially tempting to grab lots of points because maxing out a colour’s score to give you an extra turn can let you block your opponent quickly if timed right. Placing your tiles in a way that scores you points is, of course, critical; but, so is placing tiles in a way to limit your opponent’s scoring potential. It’s important to be aware of the colours in which you need points as well as your opponent as you want to make sure you score points you need but also block your opponent from what they need too. Many people are turned off by abstract games – I like themes for games too but I am open to strong abstract games which are visually appealing. 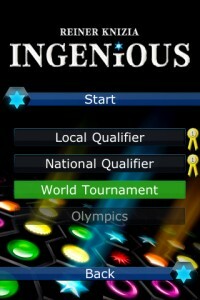 Ingenious is an abstract game that ticks the boxes for me. The interface for placing pieces in the iPhone version is intuitive and simple. You just tap and drag a piece onto the board and you can drag either end of the piece to rotate it. When happy with your placement, just tap on the piece. The AI is fast in taking its turn. At the easy level, the AI doesn’t look out too much for the colour(s) it has the lowest score in so it’s quite easy to block its weakest colour and beat it. There’s a definite change when the AI is on hard level as it’s much more aware of its scores, it scores more points than the easy AI, plus it does start to position tiles to block your future use of laid tiles too. The Ingenious board game plays up to 4 players (although the travel version is 2-player only), but the iPhone version only allows 2-player games. It’s a shame it doesn’t allow play with more players as this only requires a slightly larger board and games with multiple opponents can be more interesting. The game offers three modes of play: single games, tournament play and solitaire. In tournament play, there are 3 tournaments, each comprising of 4 stages and you need to win all 3 matches in each stage to progress to the next stage. You must complete one tournament before being able to play the next difficulty level tournament. In solitaire mode, the player receives a single tile at a time to place (not the usual hand of 6) as well as double-length scoreboards and the goal is to beat beat the scores on the high score table. In addition to playing against the AI, you can play against a human player in ‘Hot seat’ mode (one iPhone passed between two human players). There is no online play, which I don’t mind too much, but I would have liked to be able to play fully turn-based online. You can have a time limit on your total play time but this seems rather unfair when playing against the AI as, even though the interface is easy to use, it’s much harder for a player to place a piece than it is for the AI to do so. The good news is that the time limit is optional and it can be turned off even for the tournament mode. Overall, I really like Ingenious on the iPhone. I already like the boardgame and the iPhone version is well executed. The tournament mode adds a solid progression to the game and it keeps me regularly returning for a game or two as I work my way through the tournaments. Want to purchase Ingenious for iPhone or iPad? This entry was posted on Friday, October 8th, 2010 at 3:13 pm	and is filed under Board Games, Ingenious, iPhone, iPhone Review. You can follow any responses to this entry through the RSS 2.0 feed. You can leave a response, or trackback from your own site.